As the East Coast takes a beating from Hurricane Sandy, our thoughts and prayers are with those affected. May they reclaim their lives and livelihoods and return to everyday life just as soon as possible. To those in and around New York, I add a caution: Be prepared. Because, there’s another storm coming in its path. And this one is high pressure and slow moving. It’s been brewing for months now and we’ve seen it coming for weeks. You know how tropical storms are named, right? Alphabetical and alternating gender? Well, the next one is male…and it starts with a T. That’s right…it’s Tim. As in…Tebow. And it’s not going away quietly. Here’s where we’re at…The New York Jets go into their bye week at 3-5. Their best offensive and defensive players are out for the season. Quarterback Mark Sanchez can’t seem to do anything right. Head Coach Rex Ryan has never been an outspoken proponent of backup Quarterback Tim Tebow, and has in fact, taken every opportunity to support Sanchez as his starter. In the meantime, the chants for Tebow are getting louder and more frequent each week, hitting a new crescendo during Sunday’s 30-9 loss to the Miami Dolphins at home. Seeing as this is an election year, and everyone wants to blame someone…is Jets owner Woody Johnson to blame for all of this? It was Johnson after all, who wanted to pursue Tim Tebow when the Denver Broncos signed Peyton Manning and chose to release him. If you believe the reports, Tebow was offered a choice: Jacksonville or New York. Many people (myself included) thought Jacksonville was a no-brainer for Tebow. The Jaguars were a young team with some veteran talent, in need of a quarterback and leader. Tebow grew up near Jacksonville, played for Florida, where he won a national championship for the Gators and the Heisman Trophy for himself (the first sophomore ever to do so). He already had a fan base and could fill EverBank Field immediately, rescuing the Jaguars from the days of empty seats and blacked out games. It was perfect. Maybe, too perfect. Tebow instead chose the Jets. A team that had unsuccessfully pursued Manning, then recommitted to their current (albeit shaky) quarterback, Mark Sanchez, by signing him to a three year contract extension. Maybe Tebow felt like the Jaguars (under new ownership and a new coach) were unstable. Maybe he wasn’t ready to go back to Florida. Maybe, as some have suggested, he felt like the bright lights of Broadway could shine a bigger spotlight on his true love, his faith and his foundation. Whatever the case, Tebow chose the Jets. And the rest is history (actually, more like reality television) being written week by week. So what happens next? Is there a standoff between Rex Ryan and Woody Johnson? Is the cure for what’s ailing the Jets someone who isn’t yet on the roster? All I know is this…you don’t get to be a millionaire (or in Johnson’s case a billionaire) by investing in something and dumping it before giving it a chance to show its worth. 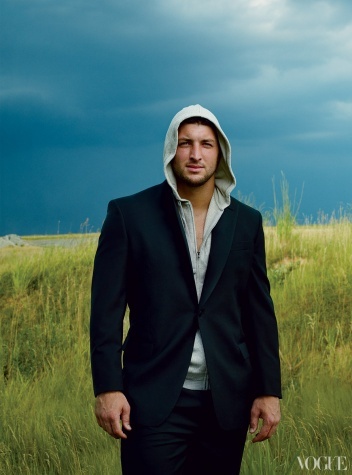 I’m not saying Tim Tebow is the savior of the Jets. But for the love of God and all things holy…let’s find out! What do the Jets have to lose at this point? Woody Johnson, 1. Rex Ryan, 0. Now brace yourselves…the storm is coming. This entry was posted in Jets, NFL and tagged Mark Sanchez, Rex Ryan, Tim Tebow, Woody Johnson.